Security forces arrest 16 wanted terrorists, confiscate weapons. On Tuesday night, the IDF, Shabak (Israel Security Agency), and Border Police searched Judea and Samaria and found several weapons. In the Menasheh Region's Kafr Tzur, security forces found two homemade weapons. In the Efraim Region's Kafr Abbush, they found an illegal weapons factory and M-16 rifles, and in Kafr Azzun they found M-16 rifles. Security forces also found weapons in the Etzion Region's Beit Fajjar, but did not disclose the types. All of these towns are Arab, with no Jews living there. Security forces gathered additional findings and confiscated all of the weapons. 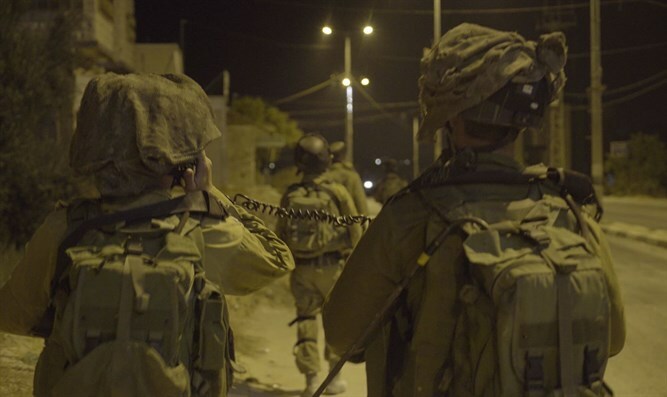 Also on Tuesday night, the IDF, Shabak, and Border Police arrested sixteen wanted terrorists. According to the IDF, 15 of the terrorists are suspected of "lone wolf" terror activities, disruptions, and violence against civilians and security personnel. Security forces arrested one terrorist each in Tulkarem, Kafr Azzun, and Kafr Abbush. Two terrorists were arrested in Husan, and three were arrested in Beit Fajjar. In the Binyamin Region, four terrorists were arrested: one from Kafr Kobar, two from Beit Rimah, and a fourth from Kafr Ein. In the Hevron-area Dura, two terrorists were arrested, and an additional terrorist was arrested in Kafr A-Tabka. Another terrorist arrested in Beita identifies with Hamas. All of the terrorists will be interrogated.